The region extending from 10 to 100 km in altitude is the middle atmosphere, which forms the interface between the troposphere near the Earth’s surface, and the upper atmosphere partially ionized by solar radiation. The middle atmosphere was once called the “Ignorosphere”, mainly because effective observation techniques were not developed until the early 1980s. 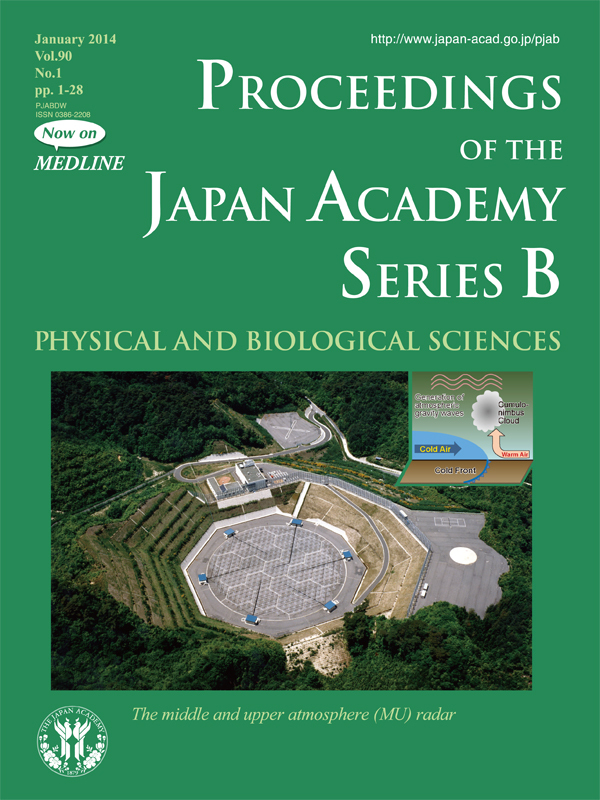 Since 1984, the middle and upper atmosphere (MU) radar of Kyoto University, shown in the cover photo, has enabled us to observe all three components of wind velocity through detection of a very faint radio wave scattering by atmospheric turbulence. This has led to a better understanding of the middle atmosphere dynamics, meteorological disturbances and ionospheric irregularities. In particular, the MU radar has clarified the generation mechanisms of atmospheric gravity waves, propagation characteristics of gravity waves transporting kinetic energy and momentum upward, and wave dissipation processes resulting in the deceleration of background mean winds. An illustration on the cover page gives a schematic outline of how atmospheric gravity waves are excited over a cold front by the interaction between the cold and warm air masses. Detailed time-height cross section of the wind velocity and temperature perturbations, depicting the actual generation of such atmospheric gravity waves, was observed with the MU radar. Atmospheric gravity waves are being constantly generated by a variety of mechanisms specific to different latitude regions of the globe. Both the MU radar and the GPS radio occultation (RO) technique have significantly improved our understanding of the important role of atmospheric gravity waves in driving the general circulation in the middle atmosphere. A global morphology of atmospheric gravity　waves has been further envisaged from the unique satellite dataset generated by GPS RO observations. In the paper entitled “Characteristics of atmospheric gravity waves observed using the MU (Middle and Upper atmosphere) radar and GPS (Global Positioning System) radio occultation” of this volume, Professor Toshitaka Tsuda, who has conducted pioneering studies in related scientific fields, provides an overview of atmospheric gravity waves and their important role in the middle atmosphere dynamics.